The opening match of the tournament will be played at the Indira Gandhi Athletic Stadium in Guwahati in which home team NorthEast United FC will lock horns with Kerala Blasters. The defending champion Chennaiyin FC will play the match on the second day of the tournament against the season 1 winners Atletico de Kolkata. There is a total of 8 teams competing for the title this year. They will play with a lot of changes as compared to previous season. All of them have introduced changes to improve the strength and potential of their squads. As of now, the teams are playing with the other nations on their pre-season tour. In this ISL 4, there is a total of 61 matches as per the time table which will complete in 79 days. The top four from the league stage will play the semifinals. The first leg of semifinals will take place on December 10 and 11 while the second one will be held on December 13 and 14. The ISL 2016 final match will be played on December 18. 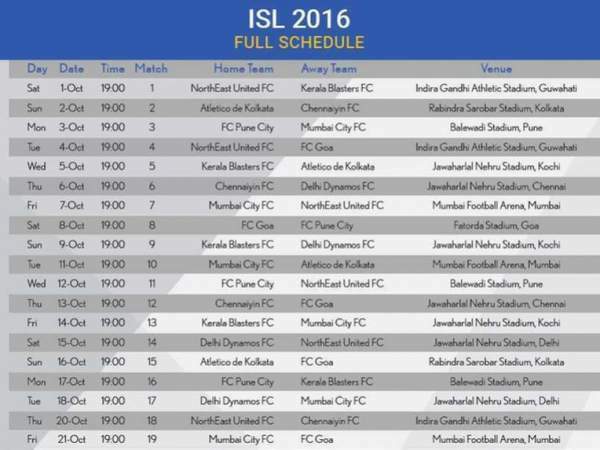 Hope you got the complete ISL 2016 Schedule: Indian Super League 3 Fixtures & Time Table. Stay tuned for latest news.